Modern calligraphy has developed like any art into it's own as the years have gone on, the styles and influences of the calligraphers that practice and influence the art itself have changed and developed. Calligraphy started thousands of years ago, originally as a decorative art for books. It was time consuming, intricate, delicate and therefore exclusive to the wealthy. However, modern calligaphy, although still seen in the same tracks as the original art of calligraphy, is a lot more accessible, as with everything in the modern era. Modern calligraphy essentially, is any calligraphy that is not traditional. Traditional fonts such as Copperplate and Spencerian are formed with specific traditionalist strokes, whereas modern calligraphy has developed away from those techniques. Whilst some people disfavour the new developments, modern calligraphy offers a lot of creative scope for a lot of people so can be respected in its own right as a form of calligraphy. With traditional letterforms, you are expected to create each letter in a specific way. They must be perfect to be considered to be written in that style. In modern calligraphy however, the imperfections are not something to concern over and in fact, some modern calligraphers have developed their style on the considered 'imperfections' straying from traditional calligraphy. Alice Gabb for example is a popular modern calligrapher who lives and works in east London. Alice's style, although capable of the traditionalist styles, tends to favour her own letter form that is unique to her and definately does not conform to any rules that traditionalists or even other modern calligraphers might follow, unless their intention was to mimic Alice's alphabet. Modern Calligraphy is accessible because of the widespread changes in the way we use the internet. As a difference to old school, traditionalist calligraphy, the modern form is something that we can access on social media, through books and in online blogs and tutorial videos. In this day and ages especially in Western society, we take it for granted just how accessible education is. Anyone can learn anything is they want to. Modern calligraphy branches off into various different forms, that should you want to learn how to, you can generally find out at the touch of your fingertips. With calligraphy being a traditional pen to paper art, the way you sit, hold your pen and choose to write with can effect the outcome, but practice makes perfect, and you'll develop your own way as you persevere. Although modern calligraphy is considered accessible, calligraphy as an art form is still something that generally needs to be learned as a skill, before you run off into the distance with it and make it your own. To learn calligraphy, it is good to start with a beginners class where you are taught by a skilled professional. Offline, hands on learning stands out as the best way to learn this art. Not only to pay homage to the tradition it was built on, but you will see your work progress much faster with the help of someone there to guide you as you take your first steps. 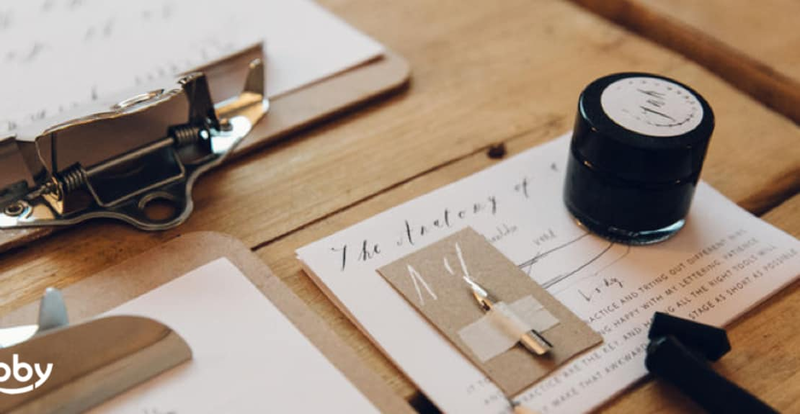 Beginners calligraphy classes on Obby always provide you with a basis of the art form and depending on the teacher will provide you with simple guidelines to follow as well as a perfect starter kit to take home so you can carry on. The best thing about modern calligraphy, is that by taking a class, you meet people whose progress you can follow on social media and as well, keep up to date with your teacher and stay in touch with them for tips and tricks along the way. The accessibility of modern calligraphy does not necessarily mean that you can learn it without leaving your house. Instead it refers to the community of the art form itself is easily accessible in spreading the word, inspiring the curious and encouraging those who partake in it.